Another pretty Josef Originals birthday girl figurine. 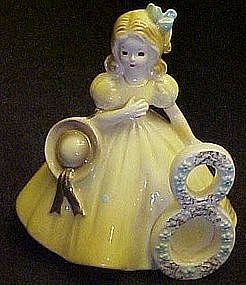 This one has a number 8 and wears a yellow dress , her hat is held on her arm. She has pretty blond hair with a blue bow. Original sticker and is incised into the Mold, Josef Originals. Measures 4 3/4" tall and is perfect with no chips cracks or repairs.